This volume summarizes current techniques; ranging from protocols for virus growth, isolation, quantification and generation of recombinant RSV virus to procedures for the efficient characterization of the host immune response to RSV infection. These techniques are used in numerous laboratories around the world and are the building blocks that support the majority of RSV virus research. Written in the highly successful Methods in Molecular Biology series format, chapters include introductions to their respective topics, lists of the necessary materials and reagents, step-by-step, readily reproducible laboratory protocols, and tips on troubleshooting and avoiding known pitfalls. Authoritative and cutting-edge, Humana Respiratory Syncytial Virus: Methods and Protocols aims to ensure successful results in the further study of this vital field. 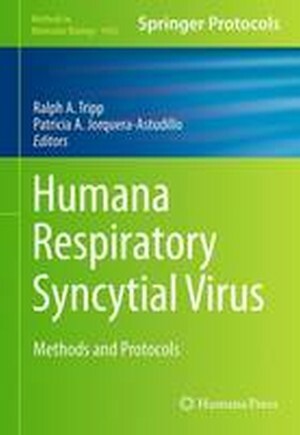 Human Respiratory Syncytial Virus: An Introduction.- RSV Growth and Quantification by Microtitration and qRT-PCR Assays.- Quantification of RSV Infectious Particles by Plaque Assay and Immunostaining Assay.- Detection of RSV Antibodies in Human Plasma by Enzyme Immunoassays.- Secretory Expression and Purification of Respiratory Syncytial Virus G and F Proteins in Human Cells.- Development of Human Monoclonal Antibodies against Respiratory Syncytial Virus Using a High Efficiency Human Hybridoma Technique.- Respiratory Syncytial Virus (RSV): Neutralizing Antibody, a Correlate of Immune Protection.- Host Factors Modulating RSV Infection; Use of Small Interfering RNAs to Probe Functional Importance.- In Vitro Modelling of RSV Infection and Cytopathogenesis in Well-Differentiated Human Primary Airway Epithelial Cells (WD-PAECs).- Reverse Genetics of Respiratory Syncytial Virus.- Use of Minigenome Systems to Study RSV Transcription.- Screening for Host Factors Directly Interacting with RSV Protein: Microfluidics.- A Proteomic-Based Workflow Using Purified Respiratory Syncytial Virus Particles to Identify Cellular Factors as Drug Targets.- MicroRNA Profiling from RSV Infected Biofluids, Whole Blood, and Tissue Samples.- Mouse and Cotton Rat Models of Human Respiratory Syncytial Virus.- In Vivo Assessment of Airway Function in the Mouse Model.- Evaluation of the Adaptive Immune Response to Respiratory Syncytial Virus.